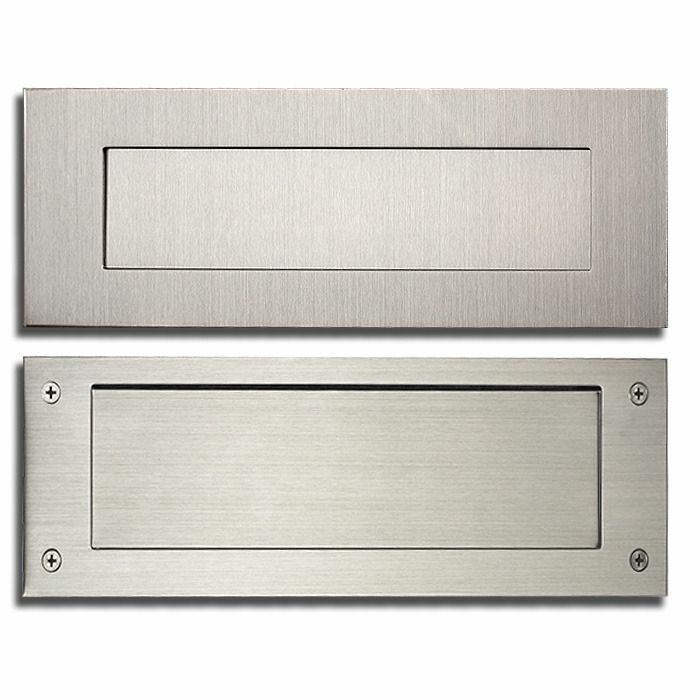 European Home Mail Slots (Letter Slots) are stainless steel with a satin brushed finish. Stainless steel is a generic term for a family of low carbon alloy steels containing 10.5% or more chromium. The corrosion resistance and other useful properties of steel are enhanced by increased chromium content and the addition of other elements such as molybdenum, nickel and nitrogen. Due to its specific chemical composition, stainless steel has a self-healing property as a very thin layer naturally forms on the surface. This layer, with the assistance of oxygen from air or water, rebuilds itself when scratched. 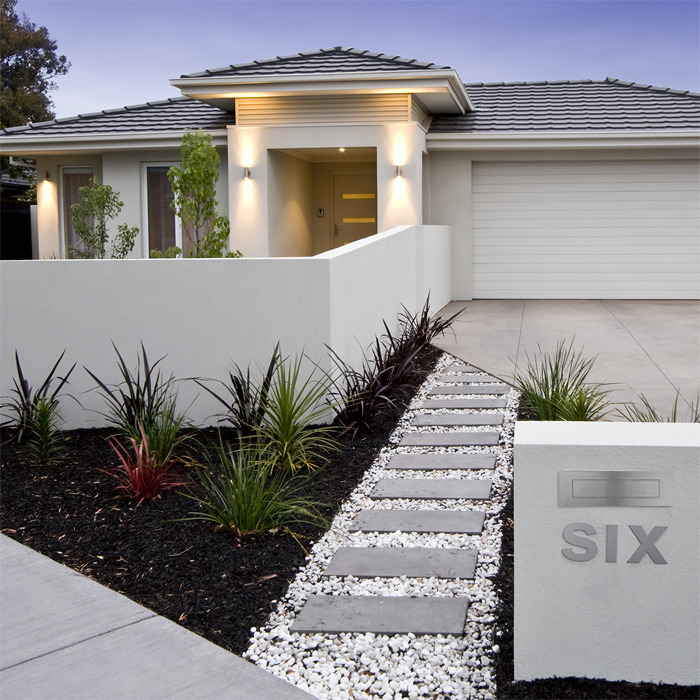 Use of 2mm Type 304 Grade Stainless Steel provides a finish that resists rust while enduring all weather types and remains crisp and â€œnew looking" for many years. Question: Can it be mounted vertically and can it be purchased without the black plate? If so, what is the cost? Also, how thick can the wall be? Answer: This item was designed to be mounted horizontally; however, it has been purchased and used vertically since the flap is spring-loaded. This item is only being sold as a package. The hardware provided is for a wall no thicker than 1.75" in depth. Question: Can I use this outdoor by the ocean or is there a different mail slot you would recommend? Answer: I would definitely recommend this one as it is stainless steel and stainless steel doesn't rust. Question: Is it brushed stainless steel? Answer: It is a Satin-brushed Stainless Steel. Question: With WL-EH-MS-13-SSBM, will I need a sleeve to prevent the mail from falling into 3/4" steel door interior? Answer: If the door is hollow, then yes. We don't have a mail slot sleeve made for that dimension. 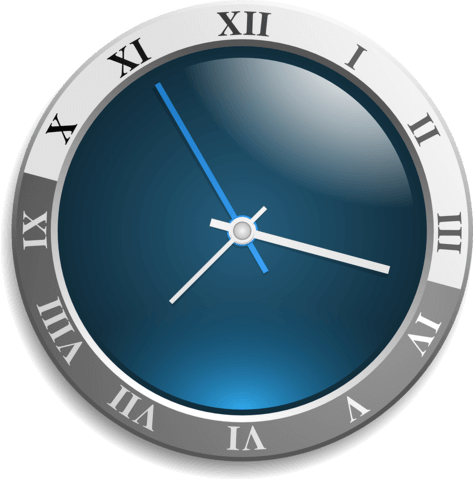 Past customers have had the sleeve locally fabricated to meet their specific needs. Question: I'm looking for a mail slot like this for a door, along with a mail receptacle. 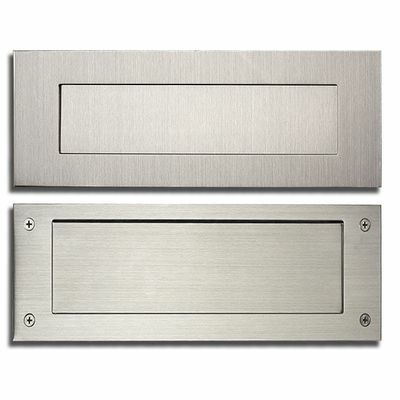 Do you have a receptacle that will work with this mail slot for a door application? Answer: If your receptacle doesn't have to be stainless steel, then you might could use this receptacle. You may need to purchase this mail slot sleeve depending if your door is hollow or not. I have included the dimension details for the mail slot sleeve. Question: Is the inner plate spring loaded too? Answer: No, the inner mail slot plate isn't spring loaded, only the outside plate is spring loaded. Question: Do you offer a sleeve to install this mailbox slot through a standard 4x wall? Answer: This item is limited to the 1.7 inch wall sleeve; however, click the link to view a mail slot that has a 4-inch wall sleeve option. Question: What is the size of the opening? 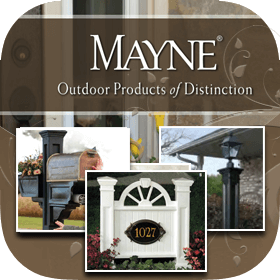 Answer: The mail slot opening is 1 15/16 inches tall and 9 13/16 inches wide. Question: Where are these mail slots made? Answer: The European Home mail slots are made in Belgium. Thank you. Question: what is the dimension of the actual mail slot opening? Answer: It is 9 13/16 x 1 15/16. 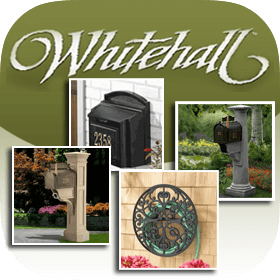 Question: Do you have vaults and recessed wall mount mailboxes? Answer: Yes, please click the link to view our selection of Vaults and Recessed Wall Mount Mailboxes. Thank you. Question: Hi. 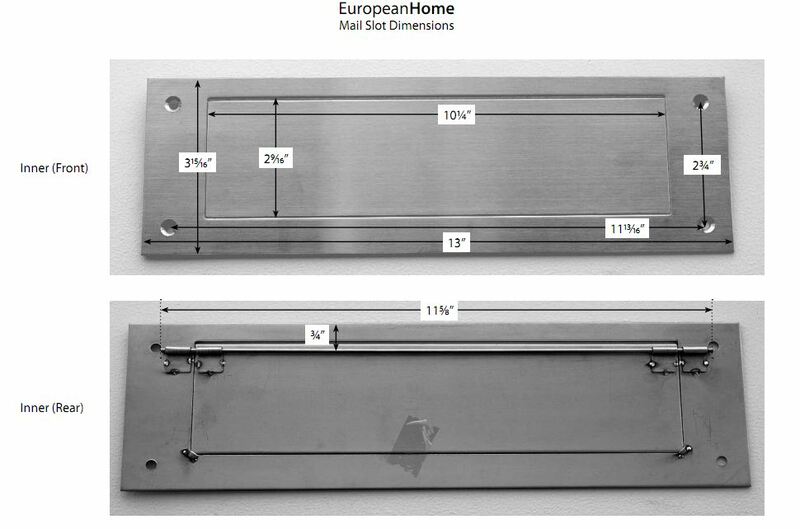 Can you tell me why this model is so much less expensive than the other "European Home" mail slots? Some of which don't even come with a rear plate. Is there a difference in quality? Thank you. 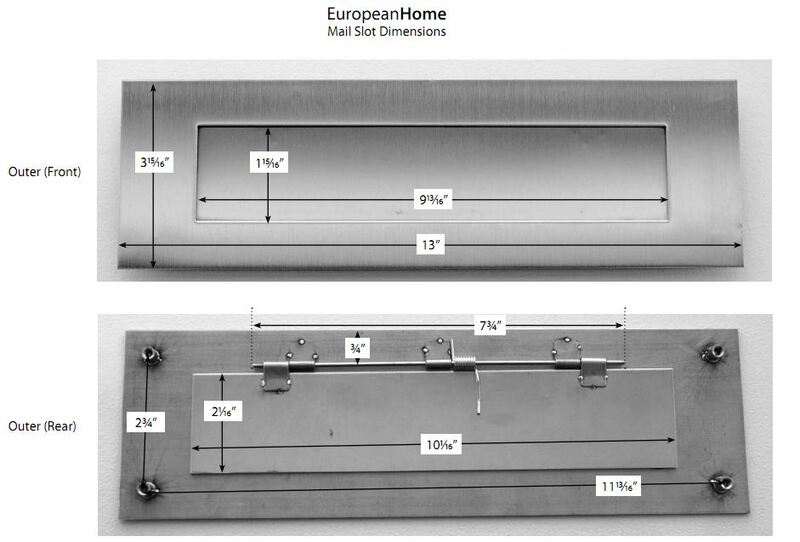 Answer: European Home has designed the slot that is listed as a front and rear plate package. The others are a line from Belgium that European Homes imports. This is the main factor of the cost difference. Question: Is this available in a black finish? Answer: No I'm sorry, but a black finish is not available.